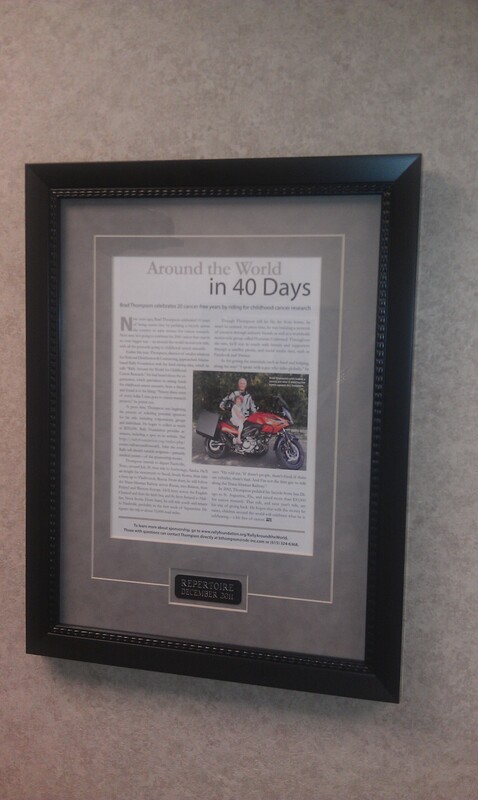 Got a great suprise in the mail from my friends at Sempermed USA…they did a wonderful job framing the Repertoire article from the December 2011 issue. Thank you Billy Harris, Karl Neubner and all the folks at Sempermed for your caring generosity and support of Rally Around the World! This is going to look terrific next to my framed Repertoirearticle from January 2003 on my bicylce ride across the US in support of cancer research. If you would like to make a donation to give all kids diagnosed with cancer a better chance at living the full life they deserve, please visit Rally Foundation & Rally Around the World..
All about Rally Around the World in the December issue of the healthcare industry trade magazine – Repertoire…the article is titled “Around the World in 40 Days” and hard copies are on their way to over 11,000 healthcare people just in time for the holidays. 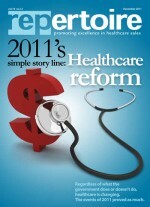 Repertoire is the only publication that serves the healthcare distribution channel. It focuses on three closely related market segments: physician office, hospital/surgery center and long-term care. The medical products sales industry relies on Repertoire to follow current market trends, gather market intelligence and find new products and services. Staffed by long-time industry veterans, it is considered required reading for the medical distribution community. Repertoire reaches the homes of over 11,000 people involved in the sales of medical products and services. Its primary readers are the 8,000 sales reps, management, purchasing/operations and executives from distribution.